Valentine’s Day isn’t just for a spouse or significant other. It’s about showing ALL others how much you care for them. Unfortunately, we sometimes find ourselves in a precarious situation…we need a last minute Valentine’s Day gift idea that won’t break the bank! Maybe you’ve decided that you would like to give something to your students, but buying candy or individual gifts isn’t really an option. Or, maybe you just want to do something creative for your family that is meaningful and homemade. Either way, this is the perfect Valentine idea! Let me give you a quick backstory. A couple of years ago, I found myself on the evening of February 13th trying to think of something nice to do for my boys. Of course, I’d waited WAY too long and was stalking Pinterest for inspiration. Thankfully, Pinterest gave me what I needed, and I made the perfect last minute Valentine’s Day gift for each of my boys and my husband. My favorite part about this gift was the fact that it was a homemade Valentine genuinely from the heart. (No pun intended.) And, since I already had all of the supplies at home, it cost me nothing more than time! In fact, it was so easy that I figured they would think it was silly. They kept their homemade Valentine hearts up for MONTHS! So, trust me when I tell you that this last minute Valentine’s Day Gift is a definite winner. 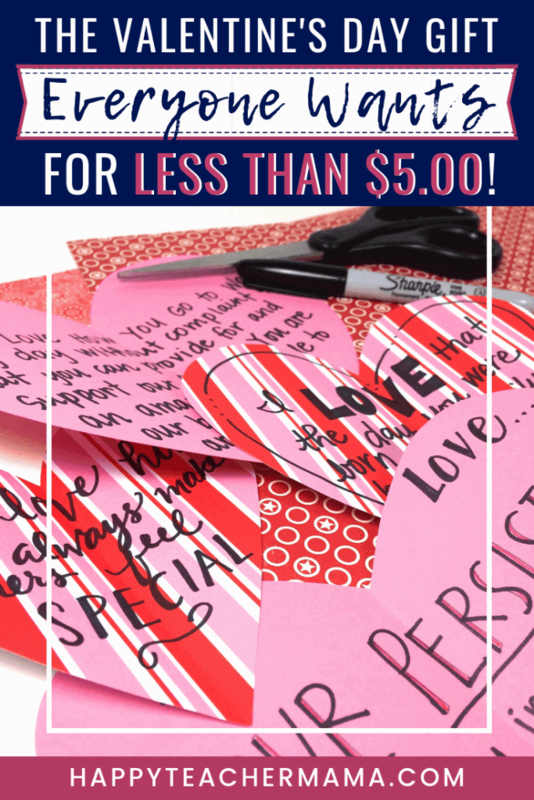 While you may be thinking, “How do you make a Valentine card? I am not crafty AT ALL!” Then you are going to be so happy to hear that this doesn’t take crafting skills. If you can follow directions, you can do this!! 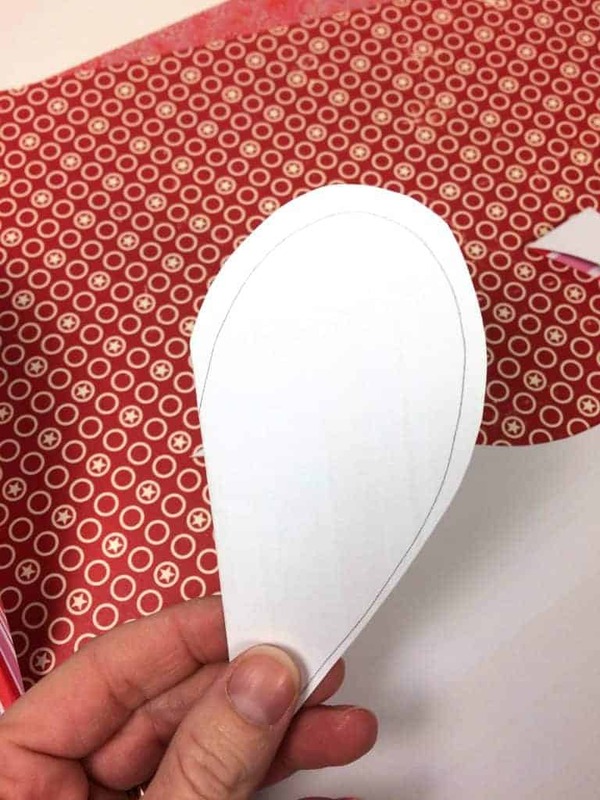 The first step in creating this last minute Valentine’s Day gift is cutting out a heart. 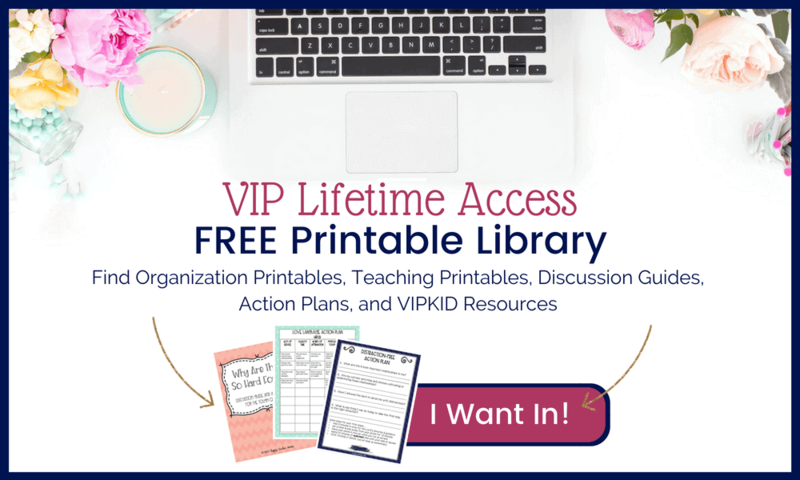 Now, I’m all about easy…especially when we’re working with a limited amount of time! 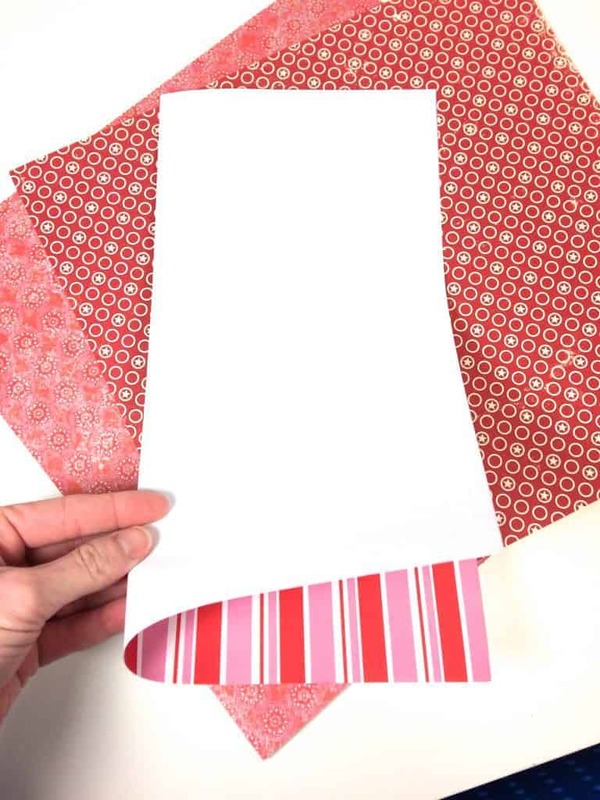 So, you simply fold the paper in half the long way “like a hot dog.” (If you’re working with scrapbook paper that has a specific design direction, make sure you are folding your paper to align with the design.) This will allow you to get the greatest number of hearts from one sheet of paper. Make sure when you fold the paper, you fold it so that the backside of the paper is facing out. And, the easiest way to guarantee a shape that you want is to draw half a heart with the inside on the fold. Then, you can erase or change the size of the heart as needed. Once you’ve drawn your hearts, just cut them out on the lines. Then, you repeat the same thing until you have the number of hearts you want. Once you have all of the hearts that you need, grab your piece of paper and start brainstorming things that you LOVE about the person who will be receiving this gift. Honestly, this what makes this simple Valentine gift so perfect. There are no rules about what you can or can’t write, but I think the most important thing to remember is to be honest and specific. So, instead of saying…. You get the idea. The more specific you can be, the more genuinely the words speak to the heart of the one who reads them. Remember, you want to try to think about what makes this person so special to you. Then when you have all of the things written that you want to say, grab your marker and write one special thought on each paper heart. 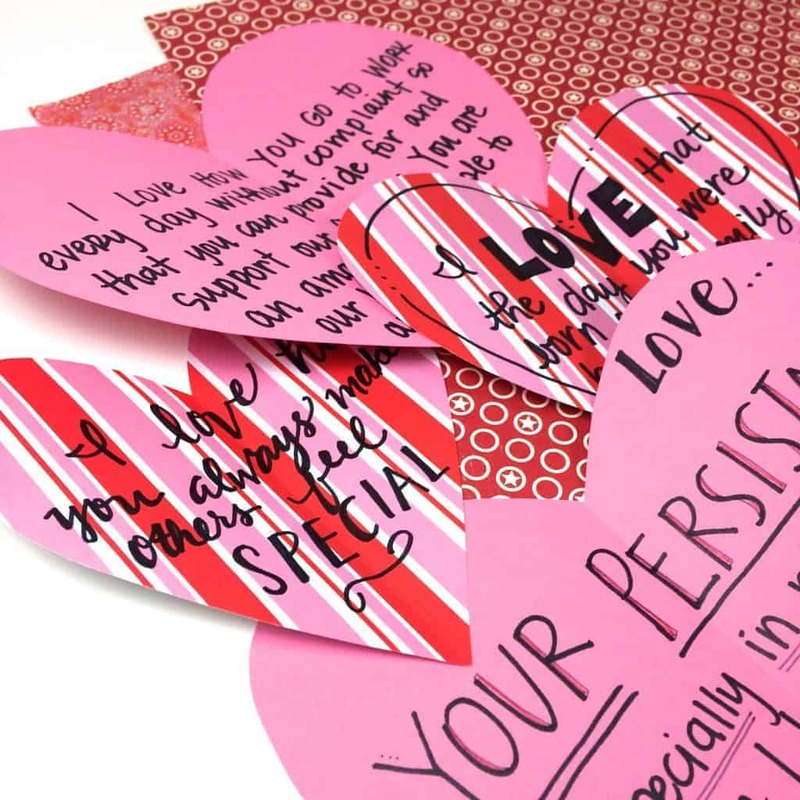 To modify this easy homemade Valentine, simply create 1-2 hearts for each of your students. Try to think of something unique and special about each student in your classroom. Honestly, there will be kids that you could write novels about, and then there will be those kids that you will struggle to find words for. But, remember, those kids need to hear that you love them more than any of the others. The last piece of this puzzle is how you want to present this special gift. When I made these for my boys, I taped them up on the walls above their desks. Then on Valentine’s Day when they went into the classroom, they spent a long time reading each of the notes on the hearts. While this is a super-simple Valentine’s Day gift, I guarantee it will be one that your kids, friends, husband, or wife will not soon forget.